This genus is accepted, and its native range is Tropical & Subtropical America. Polhill & Vidal (1981) divided the Caesalpinieae into 8 informal generic groups: the Gleditsia group (2 genera), the Acrocarpus group (monogeneric), the Sclerolobium group (3 genera), the Peltophorum group (13 genera), the Caesalpinia group (16 genera), the Poeppigia and Pterogyne groups (both monogeneric) and the Dimorphandra group (10 genera). They commented that the tribe is “a remarkable mixture of relics and complexes of relatively recent speciation, providing many pitfalls for formal systematics and biogeographical interpretations”. Polhill (1994) added a ninth informal group, the monogeneric Orphanodendron group, and placed Cordeauxia as a synonym of Stuhlmannia (both genera recognised in the present treatment) so that the total of 47 genera in the tribe remained unchanged. Within the tribe, Parkinsonia (including Cercidium), Conzattia and Lemuropisum were moved from the Caesalpinia group to the Peltophorum group (Polhill, 1994) in agreement with the subsequently published works of Lewis & Schrire (1995) and Du Puy et al. (1995b). Since 1994 several studies have cast new light on intergeneric relationships within the Caesalpinieae, necessitating the restructuring of some of the nine informal generic groups presented by Polhill (1994). As pointed out in the introduction to tribe Cassieae, the genus Ceratonia has been removed from that tribe to the Caesalpinieae, and Poeppigia has been removed from the Caesalpinieae to the Cassieae (for further detail see discussion under each genus). In the rbcL phylogeny of Doyle et al. (1997) the Caesalpinieae, as traditionally circumscribed, was shown to be paraphyletic with members scattered throughout a clade which also included genera of the Cassieae and one mimosoid genus. The molecular analysis of Kajita et al. (2001) also found the Caesalpinieae to be non-monophyletic. In the molecular analysis of Bruneau et al. (2001) some of the informal generic groups of Polhill (1994) were supported as monophyletic but the tribe as a whole was clearly demonstrated to be paraphyletic. With regard to intergeneric relationships, Pterogyne resolved as sister to a Caesalpinia group clade; Batesia and Vouacapoua fell outside a core- Peltophorum group, and the Dimorphandra group was clearly shown to be a diverse assemblage of genera, many of which share certain characteristics with the Mimosoideae, specifically with members of tribe Mimoseae (Bruneau et al., 2001). Erythrophleum was sister to a clade that comprised the majority of the Mimosoideae sampled, and Pachyelasma was sister to the two mimosoid genera Pentaclethra and Calpocalyx. Herendeen et al. (2003a) in a combined molecular-morphological analysis which expanded on the study of Bruneau et al. (2001), presented an ‘Umtiza clade’ containing Gymnocladus and Gleditsia (the two members of Polhill and Vidal’s Gleditsia Group), Umtiza (traditionally included in tribe Detarieae), Tetrapterocarpon (from the Dimorphandra Group), Acrocarpus (the sole genus of the Acrocarpus Group), and Ceratonia (from subtribe Ceratoniinae in tribe Cassieae). This new generic grouping raises some fascinating phytogeographical questions (see Schrire et al., pages 21–54, this volume). Pterogyne resolved as sister to a Chamaecrista-Senna clade (of tribe Cassieae) a relationship worthy of further study; Batesia and Vouacapoua again fell outside the core-Peltophorum group; Dimorphandra grouped with Mora as sister to all Mimosoideae, and Pachyelasma grouped with Erythrophleum as sister to the Dimorphandra-Mimosoideae clade. In the phylogenetic investigation of Haston et al. (2003), the Peltophorum group of Polhill (1994) was non-monophyletic but there was support for a core-Peltophorum group comprising Peltophorum, Parkinsonia, Schizolobium, Conzattia, Delonix, Lemuropisum, Colvillea and Bussea. Pterogyne resolved as sister to a clade containing Haematoxylum and Cordeauxia (both of the Caesalpinia group), thus supporting the earlier findings of Bruneau et al. (2001) rather than those of Herendeen et al. (2003a). Haston et al. (submitted) have further refined the relationships of the non core-Peltophorum group genera. They place Arapatiella and Jacqueshuberia with Tachigali in a newly defined Tachigali group and find strong molecular support for associating Batesia with Recordoxylon and Melanoxylon in a new Batesia group. Moldenhawera is placed in its own monogeneric group sister to a Tachigali group–core-Peltophorum group–Dimorphandra group–Mimosoideae clade. In an analysis testing the monophyly of the Umtiza clade (Herendeen et al., 2003b), Arcoa (traditionally of the Dimorphandra group) from the Dominican Republic was added to the group of genera in that clade. 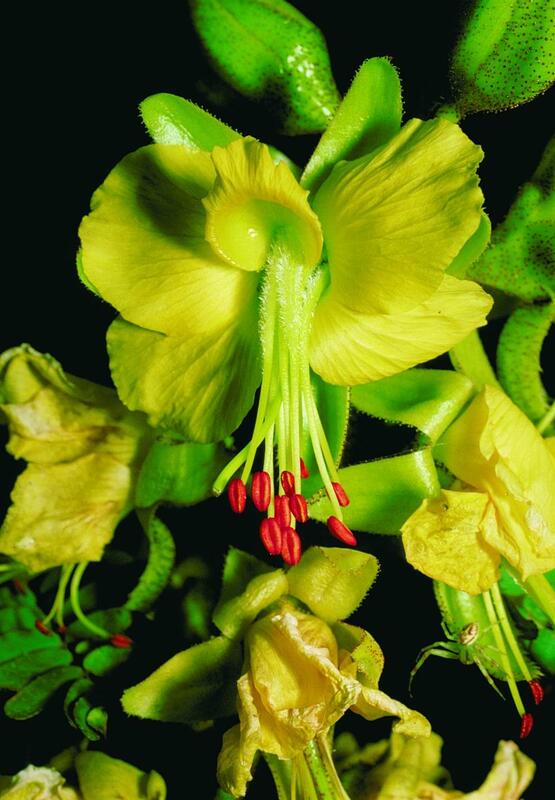 Without doubt, the genus with the greatest taxonomic and nomenclatural complexity within the Caesalpinieae is the type genus Caesalpinia, which in its broadest sense comprises c. 140 spp. and contains 25 generic names in synonymy. Of these 140 species, 12–15 predominantly Asian taxa have still to be included in molecular studies and cannot yet be assigned to any generic segregate recognised in this treatment (see notes under Caesalpinia L.). Studies by Lewis & Schrire (1995), Simpson & Miao (1997), Lewis (1998), Simpson (1998, 1999), Simpson & Lewis (2003) and Simpson et al. 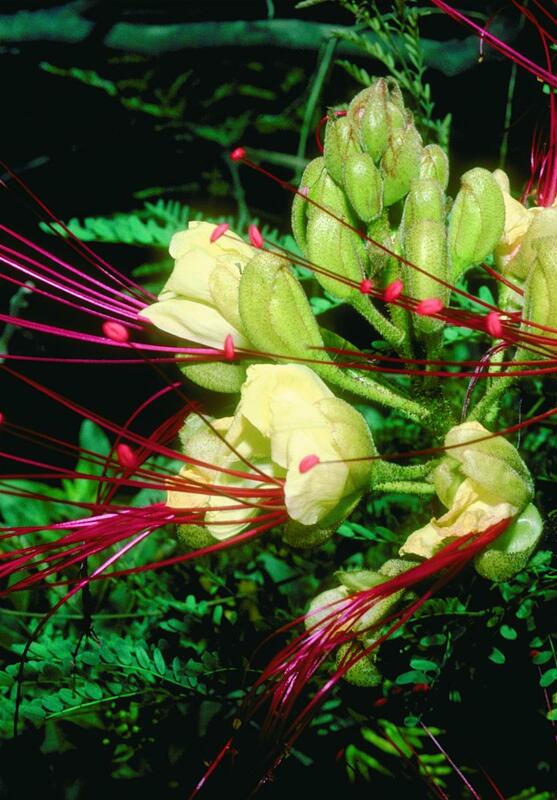 (2003), have clearly demonstrated that Caesalpinia, as traditionally circumscribed, is polyphyletic. 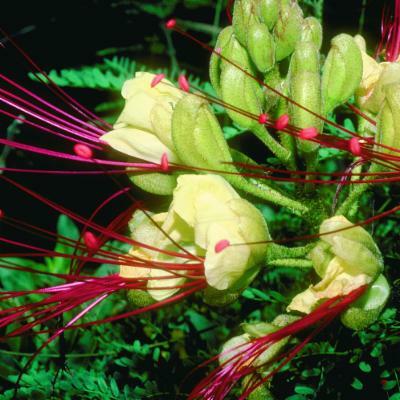 In this treatment Hoffmannseggia is recognised as distinct following Simpson & Miao (1997), Simpson (1999) and Ulibarri (1979, 1996); Pomaria is also segregated from Caesalpinia sens. lat. following Simpson (1998) and Simpson & Lewis (2003). The genera Coulteria, Erythrostemon, Guilandina, Libidibia, Mezoneuron, Poincianella and Tara are also reinstated following the findings of Lewis & Schrire (1995), Lewis (1998), Simpson et al. (2003), Lewis & Bruneau (unpublished), Lewis & Lavin (unpublished) and Sotoyo (unpublished). 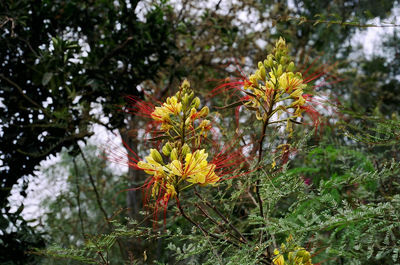 Caesalpinia sens. strict. is, in consequence, reduced to a genus of 25 species. The Caesalpinieae as presented here contains 56 genera and (423)–436–(448) species (Fig. 23). 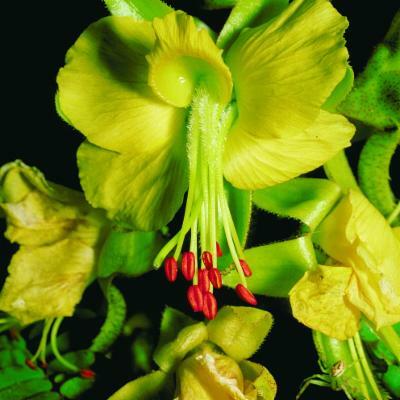 Thirty two of the genera contain 3 or fewer species each, with 23 monospecific (a second species of Orphanodendron has apparently been discovered in Colombia, but is, as yet, undescribed [Cogollo Pacheco, pers. comm., 2002]). A new genus, tentatively named as Heteroflorum by Sousa & Delgado (1993), but not yet formally published, is a monospecific Mexican endemic closely related to Conzattia. It is not dealt with here. The informal generic groups of tribe Caesalpinieae presented by Polhill & Vidal (1981) and Polhill (1994) are retained in part in Fig. 23 which accompanies this treatment, but there are some noteworthy exceptions. The Gleditsia and Acrocarpus groups are both subsumed into the ‘Umtiza clade’; Diptychandra is rejected from the Sclerolobium group which now becomes the Tachigali group and includes Arapatiella and Jacqueshuberia; Poeppigia is moved to the Cassieae; several genera are removed from the Peltophorum group leaving a core of nine related genera (if Heteroflorum is included); Batesia, together with Recordoxylon and Melanoxylon constitutes a new Batesia group based on the work of Haston et al. (submitted). Moldenhawera is placed in its own group as its generic relationships are currently unclear (Haston et al., submitted). The Caesalpinia group increases in size from 12 to 21 genera. Five genera are currently too poorly known for them to be placed with confidence: Campsiandra, Chidlowia, Diptychandra, Orphanodendron and Vouacapoua. Shrubs or perennial herbs, unarmed. Leaves bipinnate, generally with a terminal pinna, the pinnae opposite; leaflets opposite or elsewhere sometimes alternate, often with punctate glands in a submarginal row; stipules often fimbriate-glandular and subpersistent. Flowers in terminal and leaf-opposed racemes. Flowers hermaphrodite; pedicels articulated or not. Hypanthium resembling a short calyx tube. Sepals 5, imbricate, the lowest larger and curving up to overlap the other 4, pectinate or fimbriate at the apex, abscissing before the fruit matures. Petals 5, subequal except the innermost, which is modified to a greater or lesser extent (lesser in the Flora area). Stamens 10, long exserted in the Flora area; filaments densely hairy near the base. Ovary sessile to shortly stipitate, hairy and with stipitate glands in the Flora area; stigma terminal. Pod straight or curved, elastically dehiscent, with stalked, swollen headed glands in the Flora area. Seeds laterally compressed, often with fracture lines. in Link, Klotzsch & Otto, Icon. Pl. Rar. Horti Berol. 2: 97, fig.39 (1844).